The global market for bentonite is characterized by a moderate level of consolidation and is expected to experience a healthy competition over the next few years, states a new research report by Transparency Market Research. In 2015, the leading players operating in the global bentonite market, namely Imerys SA, Minerals Technologies Inc., Clariant AG, and Ashapura Group held a share of more than 75% of the global market. With the growing need to maintain a dominant position in the market, these players are emphasizing on the expansion of the production capacities so as to cater the increasing demand across the globe. In addition to this, the rising number of strategic collaborations and the enhancement of the application base are predicted to encourage the growth of the overall market in the near future. 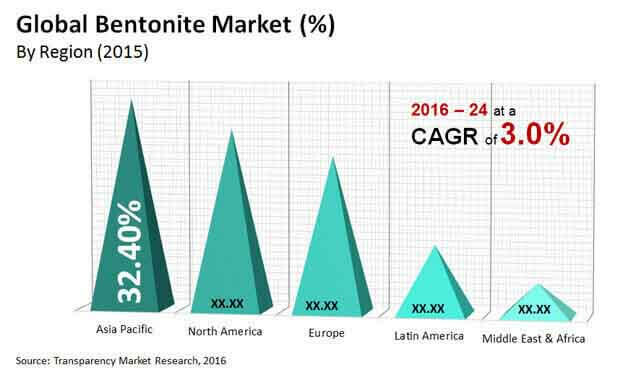 According to the research study by Transparency Market Research, in 2015, the global bentonite market was worth US$1.42 bn and is expected to reach a value of US$1.85 bn by the end of 2024. The market is projected to exhibit a 3.0% CAGR between 2016 and 2024. In the last few years, Asia Pacific led the global bentonite market and is likely to remain in the dominant position throughout the forecast period. The development of the construction industry is one of the essential factors estimated to encourage the growth of the Asia Pacific market in the near future. Furthermore, the increasing demand for bentonite from the metal industry is expected to accelerate the growth of this region in the coming years. A significant contribution from China is estimated to supplement the growth of the Asia Pacific market in the forecast period. Furthermore, North America and Europe are estimated to experience a moderate level of growth over the next few years. On the basis of product type, the global bentonite market has been classified into calcium bentonite and sodium bentonite. Among these, the sodium bentonite segment held a large share of the global market in the last few years and this segment is projected to maintain its position in the near future. The high growth of this segment can be attributed to the rising preference of consumers for green sand casting procedure in the foundry. The calcium bentonite segment is estimated to witness a substantial growth over the forecast period. The rapid development of the construction industry, particularly in developing economies is one of the important factors expected to fuel the development of the global bentonite market over the next few years. In addition, the rising demand for bentonite for the procedure of iron casting from the heavy equipment manufacturing and automotive industries are estimated to accelerate the growth of the overall market throughout the forecast period. On the other hand, the global bentonite market is projected to witness several growth barriers and limitations, owing to which the market is likely to experience a downward trend in the near future. A significant reduction in the demand for IOP grade bentonite, especially in China is projected to curb the growth of the market in the near future. Moreover, the sluggish growth of the oil and gas sector across the globe is likely to restrict the development of the bentonite market in the coming years. Nonetheless, the high growth of the cosmetics and personal care industries worldwide are considered to generate lucrative opportunities for the bentonite manufacturers in the next few years.